American Woman Faces Charges In Zimbabwe Over Tweets About Mugabe : The Two-Way Martha O'Donovan is accused of tweeting that Robert Mugabe, the 93-year-old longtime president, is "selfish and sick." O'Donovan, who denies the charge, has been released on bail. 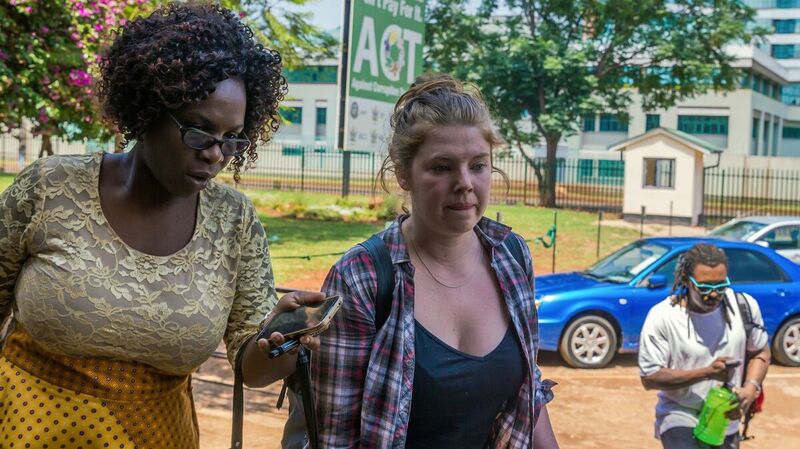 Martha O'Donovan, who was arrested over alleged subversive tweets about Zimbabwean President Robert Mugabe on Twitter, arrives at Harare Magistrate's Court in Harare, Zimbabwe, on Nov. 4. Martha O'Donovan, a 25-year-old American, is facing charges in Zimbabwe over allegations that she tweeted that the country's longtime, nonagenarian president is "selfish and sick." O'Donovan, a New Jersey native who works for a satirical news organization, was released on $1,000 bail Friday after a judge found that there was a "patent absence of facts" in the government's case against her, Reuters reports. She was arrested last Friday and had been held in a maximum-security prison until her release. O'Donovan is due back in court on Wednesday, according to The Associated Press. She describes the charges against her as "baseless and malicious," the wire service says. "During a visit to South Africa last month, Mugabe said the country wanted to crack down on social media because it was spreading lies about his government and threatening the country's already collapsed economy. "He's promised to run for re-election." The tweet O'Donovan allegedly sent included a pair of images suggesting Mugabe was wearing a catheter during a public appearance. If convicted of subversion, she could face up to 20 years behind bars. Amnesty International has called for the "absurd" charges against O'Donovan to be dropped immediately. "We fear she will not be the last to be swept up in the clampdown on social media platforms. We are calling on the Zimbabwean authorities to stop punishing people simply for exercising their freedom of expression. Social media users must not end up in jail simply for sharing their opinions."